I think Svensson’s secret is akin to the same skill Vince Guaraldi displayed on all those great songs for the Peanuts cartoons: the rare ability to convey memorable melodies with a hint of groove that don’t sound the least bit trite. Like Brad Mehldau, Svensson is a pianist who grew up with rock and electronica and has accepted them into his influences, which also include jazz and classical music. All of those influences are on the smart and lovely Strange Place for Snow, E.S.T.’s follow-up to Somewhere Else Before, last year’s American anthology compiled from his European albums. The classical chops come out on “When God Created the Coffeebreak,” which is formulated by a unison piano and bass ostinato that sounds like something Bach would write were he hopped up on caffeine. On the jazz side, “Spunky Sprawl” and “The Message” have more of a Guaraldi feel, and “Years of Yearning” and “Carcrash” are spacious ballads to get lost in. The influence of rock and electronica, and more specifically Radiohead and Bjork, are evident throughout Strange Place for Snow. In fact, “Serenade for the Renegade” sounds as if it wants to be the intro to Bjork’s “Hyper-Ballad.” While Svensson’s trio is all acoustic, ambient electronic sounds are often overdubbed for subtle texture shifts. Though much less overt than on some Somewhere Else Before tracks, drummer Magnus Ostrom, who favors brushes over sticks, often interpolates the light and nervous stop-start rhythms of drum ‘n’ bass into his playing, and bassist Dan Berglund walks not once on the album, playing in the open-ended approach of Scott LaFaro. E.S.T. 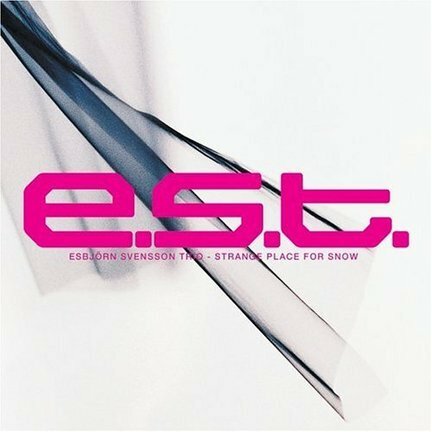 stands for Esbjorn Svensson Trio, and it’s a subtle but benevolent nod by the pianist to his bandmates and their importance to his music. E.S.T. is a band in the truest sense.